So I wish I could find this in English, because the cover looks fan-freaking-tastic. It's like Beetlejuice meets Neil Gaiman meets crazy fairy tale nightmare. Aka, you can imagine why I'm in love with it. Now if only I could figure out what's it about. Anyone know German? To add to a creepy pretty cover is a creepy pretty song. So, I know Korn isn't the first band you think of when you think of "pretty", but I actually love this cover of Pink Floyd's "Another Brick in the Wall." They add a nice, eerie flavor to it. Mysterious doors with Eidechsenknäufen (?? No idea! ), speaking stone figures and a wild girl with a hatchet ... Liv silver dreams are pretty weird lately. Especially one of them. In this dream she is in a cemetery at night, where she sees four boys in a dark magic ritual. But the guys are a very real connection to Liv's life. Grayson and his three best friends. They attend the same school as Liv and they are actually quite nice. Really scary - even more sinister than any graveyard at night - is that the guys know about things she never spoke about in daylight - but probably in a dream. Can this really be? How they manage to know that is puzzling, but Lily could never resist a good mystery. Hey, I´m an german girl and i´ve read this book. I´ll just say: This book is great! 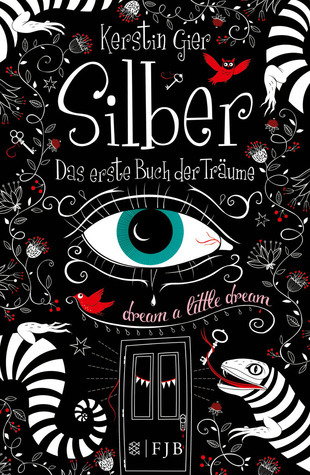 "Silber-the first book of dreams" (translated for you) is like gossip girl in combination with inception. It´s so exciting and- trust me- better than the cover. I hope it will be translated soon, so you can read it. In Germany the second book is available in June! The characters are very cool- especially Henry Harper- the boy Liv Silber is falling in love with. He´s so wonderful! And it´s so great to red this book! There are so many worlds to escape- The Frognal Academy and the Tittle-Tattle-Blog written by the gossipgirl- like secrecy, her patchwork-family and her dreams- sometimes she dreams with Henry and they both remember it and... Okay. I won´t say anything. You will love this book! Gah, I love both those things! Well, esp Inception. I really hope they do a translation soon. My German is woefully limited, certainly not up to the task of a whole novel. It sounds so delightful and whimsical, a little like Abarat. I'm so excited about it! Hey, I´m an german girl and i´ll just say: This book was great. Especially Henry, the boy, Liv Silber is falling in love with is a really WOW character. I loved the book, it´s my favourite book. "Silver-the first book of dreams" (translated for you) is kind of gossip girl in combination with inception. I hope it will be translated soon, so you can read it. In Germany the second book is available in June. And- trust me- it´s better than its cover! There are so many worlds you can escape- the frognal academy and the tittle-tattle blog of the gossip girl like secrecy, her patchwork family and her dreams- mostly with Henry Harper- he´s so incredibly wow. I think you´ll love it. Valerie: Sorry about the comment thing being weird. Apparently the blog marked it as spam. For no reason. Ah, I love when Blogger marks real comments as spam and then lets the real spam through. Sigh.